At the office of Illinois Gov. Bruce Rauner, more than 2,500 demonstrators, most wearing white “We Rise” T-shirts, staged a protest against cuts in Medicaid and other social services. In Albany, N.Y., more than 2,000 people marched to the state capitol to protest education funding cuts. In Denver, dozens of activists came out in support of immigration rights measures, including driver’s licenses for undocumented workers. 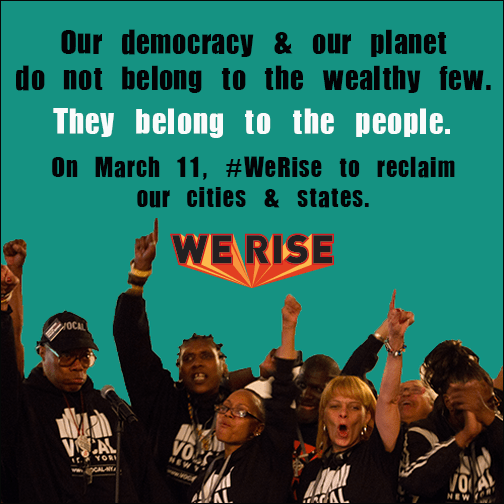 The Campaign for America’s Future is working with two of the organizations behind today’s “We Rise” events, National People’s Action and USAction, in sponsoring the “Populism2015” conference in April, along with the Alliance for a Just Society. One goal of that conference is to build political momentum from today’s events around a populist progressive agenda “for people and the planet.” Register for the April 18-20 conference in Washington through the Populism2015 website.